Jaguar XF Performance, Engine, Ride, Handling | What Car? The entry-level 2.0d 163 model needs to be worked hard if you want to make swift progress, and even then it's definitely on the slow side. The more powerful 2.0d 180 diesel is gutsy enough and our pick of the range for its balance of pace and value, although equivalent engines in the BMW 520d and Mercedes-Benz E220d are even stronger and more impressive. The 2.0d 240 (badged 25d) is also a four-cylinder engine but delivers much punchier performance. It's worth a look, but it's quite a lot more expensive than the 180 model – partly because it’s only available with four-wheel drive – and not as frugal. If you can afford it, the V6 diesel offers seriously strong performance, even from low revs. As for the petrols, a 2.0-litre unit is available with a choice of three different outputs: 200, 250 and 300. The 200 makes the most sense if you’re after petrol power, offering relatively sprightly performance and palatable running costs. The 250 is noticeably swifter, though, and still good value next to a similar-powered diesel. Go for the 300 and you’ll get the fastest XF in the line-up – it’s quicker from 0-60mph than the V6 diesel – but fuel economy and CO2 emissions are both poor. 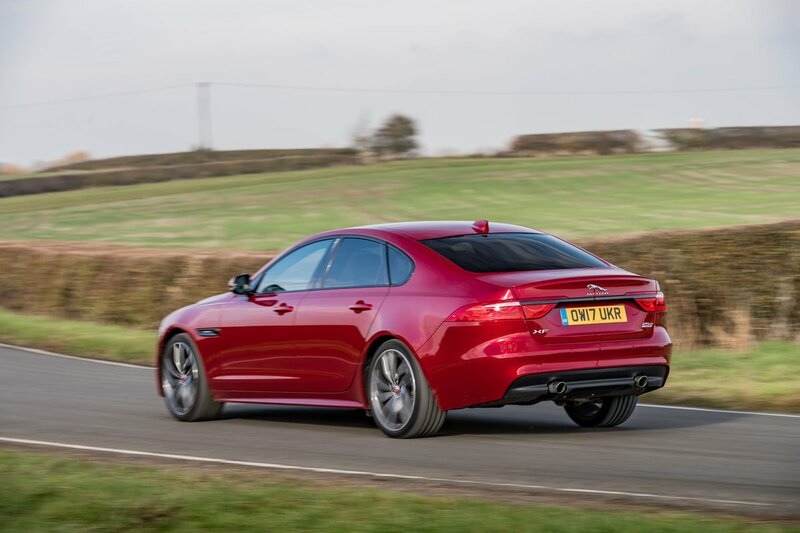 The ride is a little bit firm around town, but at higher speeds the XF is comfortable on both standard suspension and the adaptive set-up fitted to high-end versions, which include different drive modes to choose from. Expansion joints and rough roads pass beneath you with minimal fuss and the XF's body doesn't bounce up and down over dips and crests. As with most cars, adding bigger alloy wheels makes the ride firmer, but not to the point where things ever become uncomfortable. R-Sport models with any 2.0-litre petrol engine, along with the 2.0-litre diesel 180 and 240 with rear-wheel drive, get a lowered sports suspension set-up. The ride comfort suffers as a result, so we’d say it’s not worth it. This is where the XF shines. 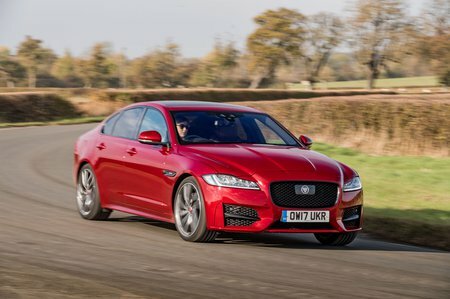 Jaguar is famous for building sporty saloons, and the XF is no exception. It masks its size well and handles with the agility of a much smaller car. A large part of this is down to the steering, which is well weighted, precise and quicker than most key rivals'. 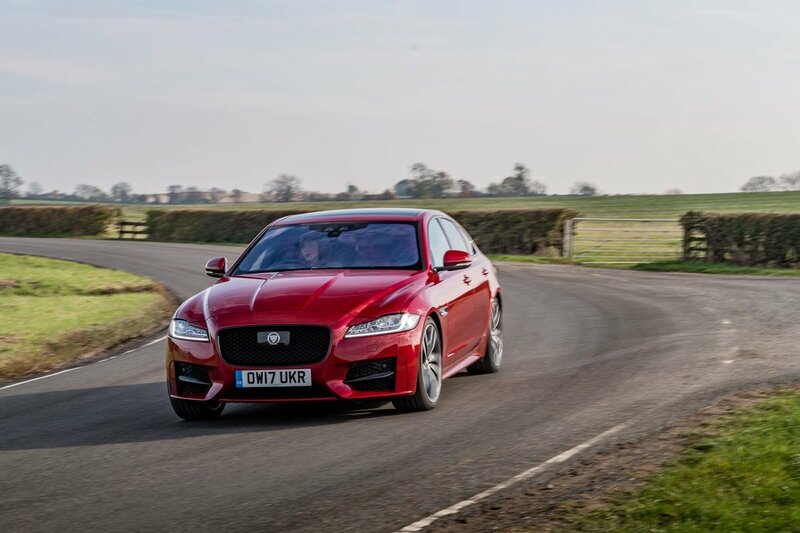 The tyres generate plenty of grip, giving you lots of confidence when driving the XF quickly along a twisty road. Meanwhile, the XF has a torque vectoring system as standard which brakes the inside wheels during tight cornering to help the car turn even more enthusiastically. Dynamic mode on versions with adaptive suspension tightens the handling up even more, but it's best left for super-smooth roads. R-Sport models corner flatter thanks to the lowered sports suspension, but it’s still not worth the sacrifice in general ride comfort. The 2.0 diesel engines aren't too vocal unless you work them hard, although the equivalent engines in the BMW 5 Series and Audi A6 are much quieter. The XF’s petrols are smoother and quieter but can still sound quite coarse at high revs. Wind noise isn’t a major issue, with only a slight whistling from the windscreen pillars at higher speeds. Overall, however, the XF isn’t quite as refined as its best rivals, because road noise can be a frustration and the stop-start system tends to send a shudder through the car as it fires up the engine. The automatic gearbox (standard on all models apart from the 2.0 diesel 163 and 180) is decent enough but will frustrate you during hard acceleration from a standstill, because it tends to dawdle during shifts.